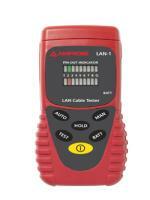 Product Description: The Amprobe LAN-1 Cable Tester is designed for testing opens, shorts and miswired cable installations. It is designed to work with various data cables and connectors. This cable tester provides a quick go / no-go LED display of the wiring and connection of item under test. You can either step through the test cable wiring one at a time or have the unit automatically pulse through the pin-outs and display the results.